As part of delivering enriching and compelling content to its audiences, Lotus FM radio drama has announced a brand new 20 episode serial starting on May 28, 2018. Called The Brave Ones, this drama explores the Fees Must Fall student movement that rocked the nation in 2016. Written by Michael van Niekerk, this drama portrays the experiences, growth and the lessons learnt by three students who are involved in the Fees Must Fall campaign. 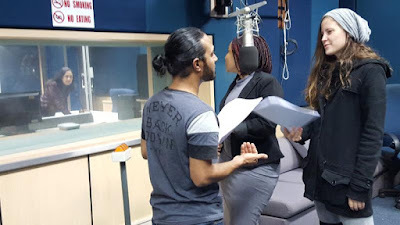 Their journey aims to take listeners through an exploration of other prejudices rife in South Africa, as well as the greater social, cultural and political context which shape these. South Africa, 24 years after democracy, is a thriving, dynamic country which is still experiencing great challenges and turmoil on many levels. This is brought alive in all its vibrancy through the special theatre of the mind which is radio drama. Seshen, Lisa and Nomfundo (played by Yusuph Kadoo, Caitlyn Goulding and Nomfundo Mkhize respectively) are three friends belonging to different race groups, who learn more about each other’s cultures and prejudices, and do some hard growing-up in the process of trying to deal with and challenge these long-held schisms which have defined South Africa’s social relations. Drama producer Raeesa Mahomed, who has been at the helm since 2006, says: ”As part of our public broadcasting mandate, we have always explored the difficult and important issues while entertaining at the same time. I can confidently say that in all my years as a drama producer, The Brave Ones is unique in its hard-hitting, unapologetic tackling of these issues, but in such an empathetic, relevant way, that it will engage one from the first episode. I’m pleased that it is happening in this very important year for us – the centenary of Nelson Mandela’s birth, which is also commemorated in the drama”. Station manager Alvin Pillay says he is very proud of this offering from the drama department. ‘Drama has always been very popular on the station and this is one more quality serial. It speaks directly to our audience and our mandate and explores a contemporary issue that has been making big news’. The Brave Ones starts on Monday (May 28) at 09h45 and is repeated at 21h45. Lotus FM’s frequencies are 87.7 in Durban, 100.6 in Gauteng and 97.8 in Cape Town.